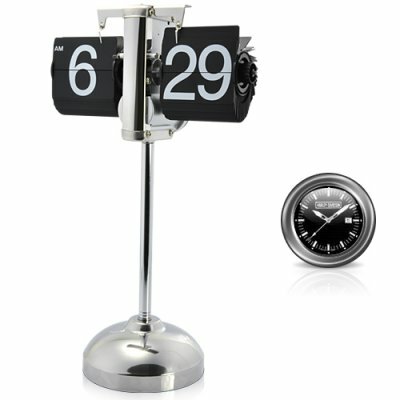 Successfully Added Retro Flip Down Clock With Telescopic Pipe to your Shopping Cart. Give the gift of Time with this super stylish, super cool, faux retro clock. This retro-look clock combines high precision electronics with steam punk design thanks to its exposed workings and gear operated flip swatches. The base, spine, and frame are all metal solid, while the flip down number swatches have been fashioned from extra durable acrylic for a desk clock meets work of art. When you need to adjust the time, the turn dial is conveniently situated on the right side of the clock while the battery housing has room for a single D battery for months and months of cool clock functioning. Perfectly placed next to your computer as well as the perfect gift for friends and family you're having trouble buying for. This retro flip down clock is identical to our CVECY-A001 internal gear operated retro flip down clock but goes one better by featuring a telescopic pipe (spine) allowing you to adjust the standing height of your retro clock from 35 cm to 57 cm. This offers better visibility due to its higher vantage point and allows it to be placed amidst potted plants or behind other desk or shelf items. Brought to you by the cool clock China wholesale and dropship experts - Chinavasion. How cool is this retro clock? No seriously, how cool is this retro clock? This retro clock is so cool it was playing with edge-cutting jazz back in the day. You can hear its flipping improvisations if you listen really carefully to So What by Miles Davis. Around the 1:17 mark, you'll hear it if you're quiet...Flip-flip-flippppp, flippity-flipppity-flip, flipppp. Flipping cool huh?